Juan Carlos Osorio’s time in Mexico has come to a close. The Mexican federation announced Friday that Osorio will not return despite its efforts to keep him on for the next World Cup cycle. Osorio is in the mix for the vacant job to lead the U.S. national team, has been contacted about the Colombia national team role with Jose Pekerman not continuing, and has fielded several other offers. It’s fair to say opinions on Osorio were mixed, but he ultimately leaves a legacy of changing El Tri’s mentality. The Argentine parted ways with Chivas this summer after a successful tenure. 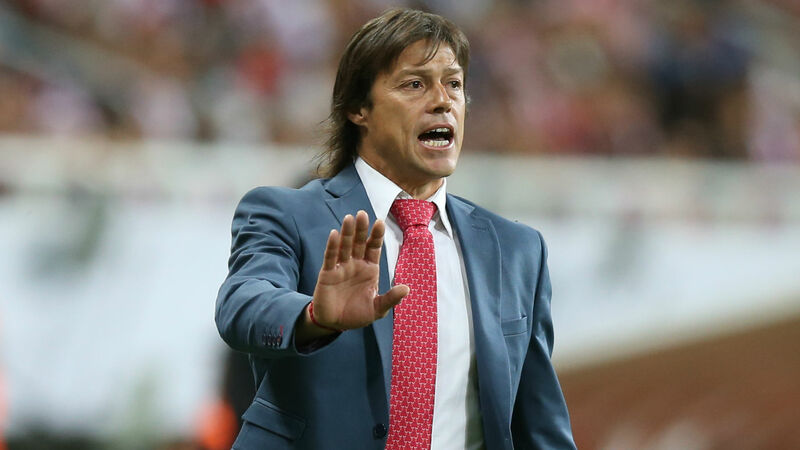 Eventually, frustrations with the club’s directors and their lack of spending led Almeyda to step aside, but not before he’d won the league, the Copa MX and the Concacaf Champions League during his two-and-a-half years in Guadalajara. While at Chivas, Almeyda mentioned his interest in coaching either Mexico or Argentina, and even though he’s no longer involved with Chivas he’s in no hurry to leave. During his departure, Almeyda said he hoped the club would give him a season ticket so he could continue to watch his players develop. His desire to stay in Mexico looked to only get stronger this month when he turned down an opportunity to manage Al Rayyan in Qatar. As manager of Chivas, which signs and fields only Mexican players, Almeyda has plenty of experience working with and developing Mexican players. He’s also expressed plenty of optimism about the future of Mexican soccer. He may be the frontrunner should Osorio step away, but will the Mexican federation again hire a foreign coach without experience in the international game? A man who needs no introduction to Mexican soccer fans, it seems enough time has passed since his last stint ended with him getting in a physical altercation with one of the nation’s most well-known soccer commentators to have his name back in the mix. Herrera had a decent tenure with Mexico before his firing and Osorio’s subsequent arrival. He rescued El Tri from the brink of missing the World Cup, getting qualified and then to the round of 16 in the 2014 World Cup. He later won the Gold Cup before his fight with the commentator. The impending arrival of former Televisa executive Yon de Luisa as the new president of the federation has built on the idea that Herrera could return. Televisa owns Club America, Herrera’s current employer, and “El Piojo” knows De Luisa and other decision-makers. But do fans really want Herrera back, knowing his tactical limitations and having seen exactly what he can deliver in his last stint? Some will answer yes, and do so as emphatically as Herrera celebrates goals. Others would be less thrilled with a return. Most recently the coach of Club America, “El Bigoton” is now uploading tactical breakdowns to YouTube and tweeting on topics from football to dating advice. He also jumped on as a technical advisor for new Egyptian club Pyramids FC. It’s a safe bet he’d be willing to put those pursuits aside and take over as Mexico national team coach once again. La Volpe’s fingerprints are all over the Mexican game from the tactical modifications he made in the 1990s. That’s sort of the issue with hiring La Volpe, though. Rather than a hire seen as taking Mexican soccer forward and building on the progress made by Osorio, it would be the same man who took El Tri to the 2006 World Cup. At 66 years old, La Volpe may be ready for one last go-round before he is off to enjoy retirement, but whether Mexico would hire a coach of his vintage is a big question. The sexual harassment case hanging over him dating back to his time as Chivas coach in 2014 may also raise concerns for the federation beyond simply what La Volpe can do on a sporting level. Speaking of older coaches, there’s 68-year-old Jose Pekerman. The Argentine, like Osorio, has a particular way of working and hasn’t always been beloved by the football hierarchy of his country. Yet after strong World Cup showings in 2014 and 2018, it’s clear the veteran manager has been good for Colombian soccer. He’s headed elsewhere after leading Colombia since 2012. If Pekerman is out and Osorio takes over the Cafeteros, why not give Pekerman a look with El Tri? The countries are different in some ways, but share plenty of characteristics as ‘mid-tier Latin American soccer nations.’ Whether, at his age, he’d want to work with a federation that can be as obstinate as the Mexican one could determine whether or not he’d be a serious candidate. That’s especially true with the chance to return to Argentina and take on a large role in the setup as the director of football apparently on the table. Another member of Latin American coaching’s old guard, Ferretti actually has coached Mexico within the last five years on an interim basis. Of course, when asked if he’d continue in the post, he said the job wasn’t for him and as recently as a week before the Liga MX season was adamant that despite being asked “50,000 times” if he’d be interested in the job that the answer is still no. He is, however, beloved by the Liga MX club owners who still have a say in who leads the national team. Reportedly, their hope was to retain Osorio with plan B being to convince Ferretti to take the post. Ferretti is a savvy man, though. He knows he has it good at Tigres where he can see out the final three years on his contract and retire at age 67, without dealing with the headaches that come with leading El Tri. Who knows what Andres Villas-Boas is up to these days? Well, aside from racing a car in the Dakar Rally a few months ago (he had to pull out with a back injury). While nothing is confirmed, there’s chatter that FMF officials and Villas-Boas may have at least spoken in the not too distant past – like as recently as during the World Cup. Villas-Boas’ last several jobs have given him the kind of salary that allows him to, well, go off and race rally cars. Could an international job intrigue him enough to get back into the game? He’s a tactics-first manager who could continue some of the progress Osorio has made. AVB got the best out of several players by moving them into other positions or tweaking their roles to suit their skillsets. And after a bit of time away, maybe the 40-year-old is ready to get back into the game, taking less money to explore the international side of things. It’s a huge long-shot, but it could be one of the better options Mexico has.